Garlic Barbecue Pot Roast - Let the Baking Begin! This Garlic Barbecue Pot Roast Recipe is juicy, tender meat with onions, garlic, and barbecue sauce. This is a simple Roast Beef Recipe the whole family will enjoy! Enjoy this Pot Roast Recipe with a side of mashed potatoes. 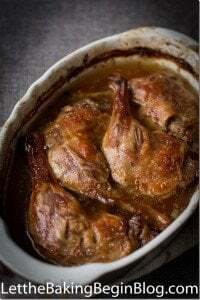 There is nothing better than a simple dinner recipe like this juicy and tender Pot Roast Recipe. I love doing all the prep for this Roast Beef Recipe ahead of time, as it makes it so much easier. The caramelized onions, garlic, and barbecue sauce bring such a delicious flavor to the Pot Roast. Can I use the liquid from the Roast Beef? When it comes to making this Garlic Barbecue Pot Roast, you’re left with a flavorful liquid which will make a perfect base for Borsh or soup. All you have to do is pass the liquid through a sieve and discard all the solids. Reserve about 1 1/2 cups liquid, and use the rest as the base for a soup or cool and freeze for future use as a soup or sauce base. In a large pot, add beef and cover with water. Bring the water to a boil on high heat. Cook for an additional 2.5 hours over medium-low heat. Remove impurities during cook time. Or cook in an Instant Pot for 90 minutes, allowing natural pressure release at the end. After 2.5 hours, once the meat is soft, add a whole onion, carrots, salt, peppercorns, mustard seeds, and bay leaves. Cook for an additional hour. After 3.5 hours the meat should fall apart easily, that is when you know it is done. Remove meat from pot, pass liquid from the pot through a sieve, and discard all the solids. Reserve 1 ½ cups of liquid. If you do not want to prepare the roast right now, just let the beef cool, then refrigerate until ready to use. Cut onion into half rings and saute with oil over medium heat until browned. Prepare all ingredients 30 minutes before serving. Preheat oven to 425°F. While the oven preheats, shred the chunk of cooked beef into small pieces. 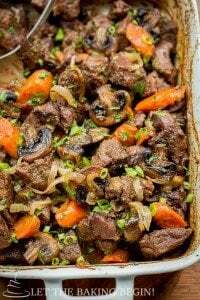 Place shredded beef into the baking dish along with the cup of reserved liquid. Bake uncovered for 15 minutes, stir and roast an additional 15 minutes. Add the caramelized onions, minced garlic, BBQ sauce, parsley, and green onion and mix until evenly distributed. Serve right away while hot. Best served with mashed potatoes, polenta, over rice or with noodles with a side of steamed or pickled vegetables. There are so many different ways that you can prepare Pot Roast. 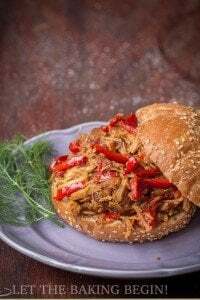 You can prepare it with vegetables, in a slow cooker or in the oven. What is your favorite Pot Roast Recipe? 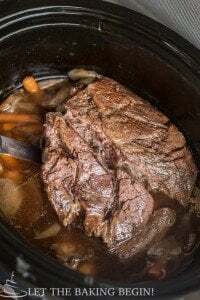 Perfectly Simple Pot Roast – Beef cooked in a slow cooker. 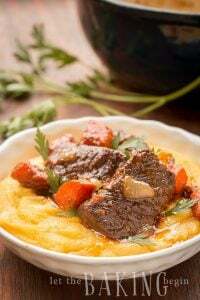 Braised Short Ribs Recipe – Short ribs cooked into tender, juicy meat chunks. Beef with Caramelized Onions and Mushrooms – Cubed beef chuck roast with mushrooms and onions in a wine sauce. This Garlic Barbecue Pot Roast Recipe is a juicy, tender meat with onions, garlic, and barbecue. To a large pot add the beef, cover with water by about 3 inches and bring to a boil over high heat, then cook over medium-low heat for 2.5 hours, constantly skimming off impurities that float to the top with a slotted spoon. After about 2.5 hours when the meat is somewhat soft add 1 whole onion, carrots, salt, peppercorns, mustard seeds, and the bay leaves and cook for another 1 hour. While the meat is cooking, saute the onion in some oil over medium heat until evenly browned. Remove onion to a different bow. After about 3.5 hours of cooking the meat should be very soft and fall apart easily, that's when you know that it is ready to be removed. At this point, remove the meat from the liquid to a separate bowl. Pass the liquid through a sieve and discard all the solids. Reserve about 1 1/2 cups liquid and use the rest as the base for a soup, or cool and freeze for future use as a soup or sauce base. If you do not want to prepare the roast right now, just let the beef cool, then 30 minutes. Prepare all ingredients. Preheat oven to 425F. While the oven is preheating, shred the chunk of cooked beef into small pieces, discarding any fat. Place the beef into a baking dish and add 1 cup of reserved liquid. Bake uncovered for about 15 minutes, then stir and continue roasting for another 15 minutes (30 minutes total). Add the caramelized onion, pressed fresh garlic, BBQ sauce, parsley, and green onion and mix to distribute ingredients evenly. Any suggestions if cooking in an instant pot? Sure thing! I would cook the beef for about 90 minutes, then do 15-20 minites natural pressure release and then follow the rest of the recipe. Just got to making this–so so good!!! I love that you can boil the meat ahead of time and finish right before serving! Thank you! Thank you for your feedback Zhenya! how do you make the polenta? I usually boil about 3 cups of salted water in a non stick pot, then add 1 cup of corn meal while whisking continuously. Then using a wooden spoon I continue stirring as it cooks and thickens. If you like it to be thick, so you can cut it with a knife, cook it with 3 cups water to 1.5 cups corn meal. Lately we’ve been enjoying it thinner, but it’s still not runny at all. If you cook the thicker version, you can invert the cooked polenta onto a flat dish, but if you make it thinner you will need to serve it in a bowl.